A Great Shift of consciousness is taking place across the Earth, progressively unraveling the old reality and elevating sentient life into a New Paradigm of Being. Humanity has lived for too long disconnected from the natural flow, thereby creating a disempowering reality. But now souls are breaking through and integrating divine beingness. We're shifting into 5D consciousness. You become interconnected with the natural flow of the Universe, with signs and synchronicity guiding your every step. There's no need to effort and struggle - life becomes about expressing your true self, unfolding ever more profound gifts of your soul, constantly supported by the divine. We're well into the shift right now, and as the light is breaking through, it's stirring up the ‘sediment’ that’s blocked the stream. The karmic construct is unwinding, so in the physical world, it’s going to look darker and denser. But let that not discourage you. Realignment with the soul is the way to resilient, successful and miraculous living in a higher paradigm of being, that exists here and now, all around us. It’s time to empower your cosmic self! The way to true success and fulfilment in life, is to recognise the one, underlying purpose of the Universe: to unveil YOU as a profound expression of the One. The Universe is constantly working in every moment to facilitate this divine beauty. 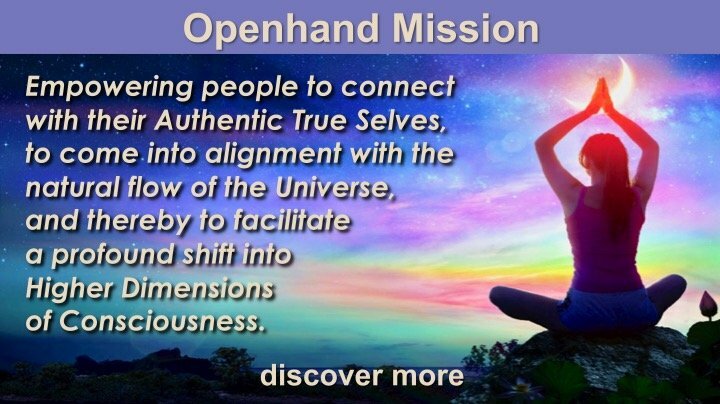 The Openhand Approach is a way - a spiritual compass - for connecting you to the core essence of your soul, by feeling through inner density, and unleashing the majesty that is you. By expressing this profound beingness, your whole world shapes in the most magical of ways (discover more...Openhand Approach). Human Origins...how did we really evolve?